East Wind Caterers in Wading River, New York has something for every bride. Three distinct venues on the property offer an eclectic choice to anyone considering a wedding on the North Shore of Suffolk County, Long Island. For starters there is the original Estate at East Wind, a wonderful venue where only one wedding at a time is hosted. The grounds surrounding the estate are meticulously landscaped and include a gazebo on the great lawn which is perfect for wedding pictures. A private outdoor courtyard is home to your fair weather cocktail hour and/or ceremony and the grand ballroom is perfect for your elegant wedding reception. For smaller parties The Cottage at East Wind is located to the south of the Estate. It, too, features amazing gardens as well as a small pond. This, too, is a wonderful location for great wedding photographs. Finally, the most recent addition, is The Inn at Eastwind...probably the most amazing hotel and resort this side of Montauk and the Hamptons. 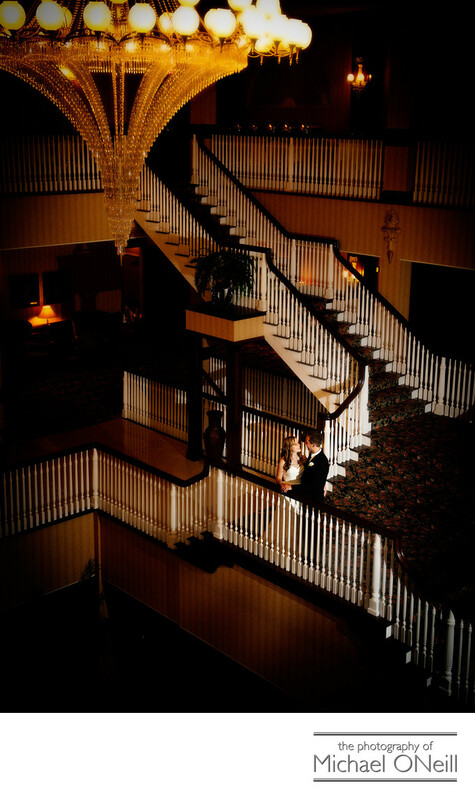 The shot you are looking at here was taken in the main lobby of The Inn which features not only spectacular ballrooms for your event, but also luxurious accommodations for all of your out-of-town guests. I have been working at East Wind since their inception and am experienced in creating great wedding photography at all of their venues. Give me a call at my East Northport, NY wedding photography studio to discuss your plans for your East Wind wedding.